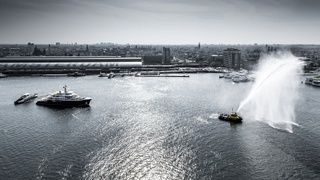 The 63.72 metre Hakvoort yacht Scout has been delivered to her American owners. 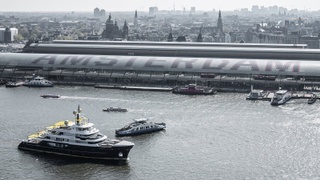 The brand-new explorer yacht, which is now the yard's flagship, left the Netherlands yesterday (April 17) and began her maiden journey to the US. 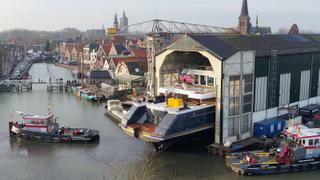 It comes after Scout, which was designed to look like a conversion from a commercial vessel, was launched for the first time in December 2018. Built in steel and aluminium, Scout was designed inside and out by H2 Yacht Design, with naval architecture by Diana Yacht Design. She was built for an experienced owner who wanted to build a boat inspired "by the iconic 1950s movie, 20,000 Leagues Under the Sea," the yard said. It added that the result is "a strong vintage maritime aesthetic" that is "authentic to the owner’s vision". With a beam of 11.6 metres and a draft of 3.25 metres, Scout accommodates eight guests across four staterooms on the main deck, with a dedicated owner’s deck above. Each cabin is designed with a specific nautical design. Crew accommodation meanwhile is found on the lower deck. Key features include a helideck, forward observation lounge and an expansive sundeck which "allows unobstructed views fore and aft," Horsfield said. Scout also has "forward-sloping windows that embody the trawler-aesthetic of her design", a high, Ice Class bow and cut down bulwarks. Scout is powered by twin Caterpillar 3512C engines for a top speed of 14.8 knots and cruising speed of 12.5 knots. She has a range of 4,800 nautical miles.